Here are the facts of the matter: Upper Hutt developers Malcolm Gillies and Kevin Melville have bought Plimmerton Farm, 368 hectares of land beside State Highway 1 north of Porirua, and plan to build 1500+ sections and 60 lifestyle blocks. See Stuff’s full article here. So, what will this “terrific suburb” mean for Porirua, Transmission Gully and the surrounding areas? Will there be basic, affordable homes for those just starting out? Will there be tiny homes for those who want to live the simple life; it is farmland after all? Will they go green and have composting toilets, solar panels, rainwater collection, roof gardens and more? 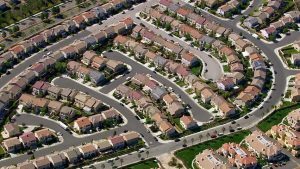 Will the suburb have a beating heart? I have so many questions and very few answers. They might do an incredible job, be developers with soul who are future thinkers. They also might just be in it for the money, because isn’t that why they go into the business in the first place? But, and this is a big but, over 1500 sections + 60 lifestyle blocks = a whole heap of people and, more likely than not, a whole heap of cars – unless the suburb is designed very differently from what we’ve seen to date in Porirua. Plimmerton has its very own rather nice railway station – but once we’re in our cars we tend to go “Oh well, I’m on the way, might as well go all the way”. Exhibit A: traffic out of Aotea suburb, a hop and a jump from Porirua Railway station – because every house has a double internal garage and the whole place encourages driving. So what other transport links will there be for Plimmerton Farm’s new suburbanites? Transmission Gully, coming our way in 2020, will supposedly save time (oodles of it, 10 whole minutes for Kāpiti to/from Wellington) but then, if you’re adding another huge area of people and make it so they’re all encouraged to drive, what will that do to travel times? And what of schooling for the children of families destined to move in? Will Porirua and Plimmerton itself be inundated with dropoff traffic at school times and will we see more “gate rage”? Will Plimmerton Farm be built so kids can walk or scoot to the local schools? How will Porirua council manage with the influx? I have an enormous question that probably can’t be answered and should be saved for another piece. Why is this conservative, neoliberal, capitalist society so obsessed with more more more? Greater populations, more money, bigger, stronger, faster does not necessarily equate to better. Let’s get back to the matter in hand. Plimmerton Farm. Do you think it’s a marvel or a marvellous waste of opportunity? What would you say to the developers if you had the chance? Have at it, folk! We should be increasing density around existing train stations rather than turning arable land into car dependant suburbs, which lets face it, this will be. These new suburbanites will be dropping kids off at schols throughout the region and using TMG to commute to Wellington for work thus adding to the congestion. Assuming access to the new suburb is adjacent to Whenua Tapu, then Pukerua Bay Station is 1.5km North and Plimmerton Station is 3km South. There is a nicely graded, sheltered, landscaped and very safe gravel bicycle path running on the West of SH1 from Plimmerton to Pukerua Bay. Unfortunately there is currently no safe way to access to it from the new subdivision unless an over bridge (or under bridge) is built across the current high-speed 4-lane highway. Also I don’t think there is any lighting anywhere on this section of the highway or cycleway. Assuming an expensive over-bridge/under-bridge does get built, then for individuals travelling to Pukerua Bay or Plimmerton, taking a bicycle could be a viable alternative to taking the car. For daily commuters to Wellington or Porirua, ‘e-bike and ride’ during the months of Daylight Savings Time would be an attractive option, provided good bike-storage facilities were provided at Pukerua Bay and Plimmerton (e.g. by replacing half-a-dozen or so ‘park and ride’ car parks). I don’t think there are currently any bus routes to Pukerua Bay, but perhaps within 20 years time the new suburb might generate enough additional demand or social benefit to make such a route worthwhile. Transmission Gully should take a lot of traffic off this section of SH1, and I would expect average traffic densities here to be significantly lower even after the suburb has been fully built out with 4+ double-bedroom double-garage McMansions. No-one travelling by car from here to Wellington (or Kapiti) would use Transmission Gully (TG) – it would be much quicker to reach either end of TG using the existing highway than to travel along the narrow and winding Grays Road to Pauatahanui to access TG. And the morning rush-hour tail-back on TG where it merges with the Porirua Motorway is likely to extend all the way back to Pauatahanui anyway. All-in-all, I think it will end up as a very nice, quiet, car-centric, semi-rural suburb at the upper end of the property market. A bit like a cross between Maruia Heights and Riverstone Terraces in Upper Hutt. They might even put a gate on the entrance. The distance between Plimmerton and Pukerua Bay is quite far, by the standards of the line south of Porirua (ie Tawa, Linden, Redwoods, etc). 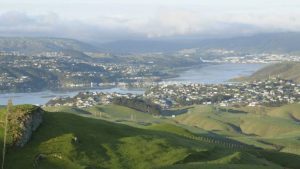 What really SHOULD happen is that the Council should not permit the development of the land until a new station is built – probably south of When Tapu, and decent connections made over the SH1 ie a bridge, as Clamobactor says above. It is a really simple step for GWRC and PCC to make – “we’ll put in a station, you pay for the bridge, and only then will we give you permission for land consent for the thousands of houses”. It’s TOD 101 – development at a basic level. Don’t do it without that. Is there any precedent for that in NZ?